I do believe in Art for Art’s sake. 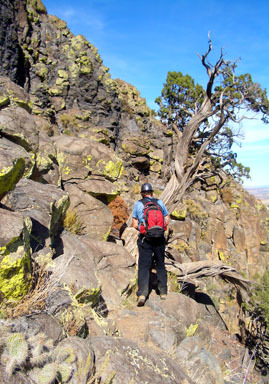 The Pueblo and Navajo Indians believe that the peak has religious significance, and remnants of their visits still exist. 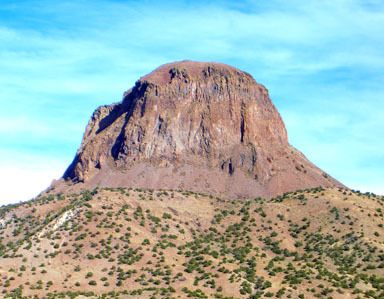 One Navajo myth explains that, after a giant was slain upon Mount Taylor, his head remained as Cabezon Peak and his blood congealed to form the Malpais, or bad-land volcanic flow south of the peak. 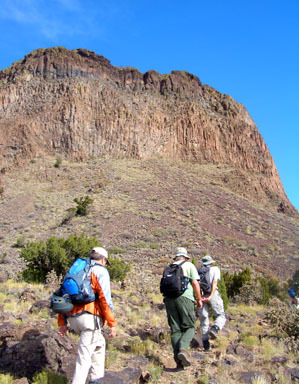 This is the easiest route up Cabezon Peak, and it provides a short hike and scramble to a spectacular summit. 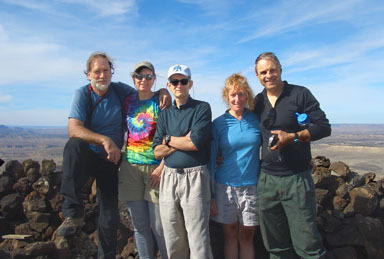 The tour makes a nice day trip from Santa Fe and environs. 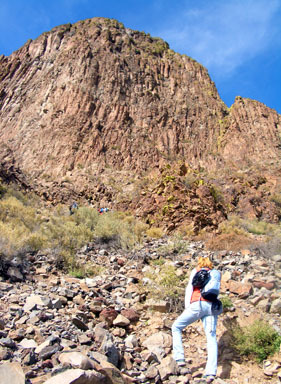 The peak requires a short hike on a good use trail followed by a Class 3 scramble up a steep gully, an ascending traverse, and a final Class 3 wall. 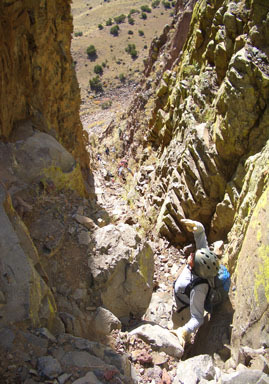 You can climb Cabezaon in all seasons including winter, but the Class 3 gully and upper wall can be icy and dangerous after heavy winter storms. Loose rock is plentiful on this route, and I recommend a helmet. 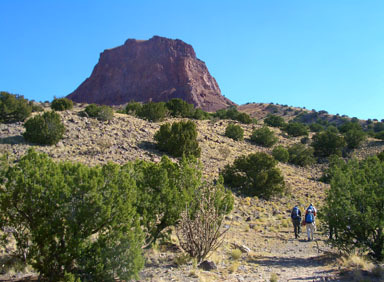 Start at the Cabezon Trailhead at 6,480 feet. From here, you have an unobstructed view of the peak’s imposing west face. This is not the route. To reach the route, go 1.0 mile east, northeast, then north up a good use trail to a flat bench at 7,130 feet directly below the peak’s upper east face. Your Class 1 approach hike is over and you can see part of the route from here. Leave the security of the bench, and hike west up a loose rock slope to the bottom of a shallow, east-facing, white gully. This is the beginning of the scrambling. The initial sequence on the gully’s white rock is Class 3, but the difficulty quickly eases to Class 2+. 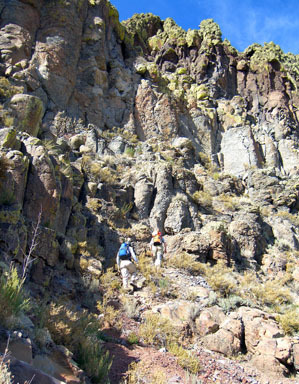 Scamper up 150 feet to the base of a much narrower, southeast-facing upper gully. Scamper up the gully on steep Class 2+ rock, then halfway up the gully, climb a steeper Class 3 passage. These are the route’s hardest moves. 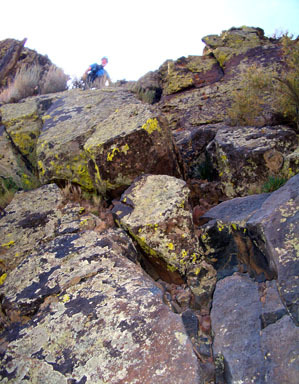 Above this crux, continue up to the top of the gully on surprisingly steep Class 2+ terrain. At the top of the gully, the summit is close, but your work is not yet done. 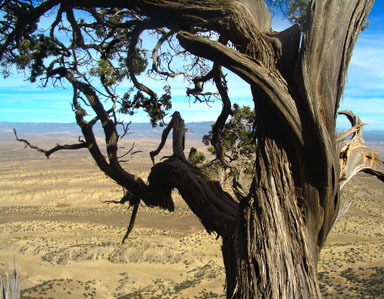 Scamper west above the top of the gully, traverse north on the continuing use trail, climb up a broken area, and traverse north to a weathered, multi-branched Juniper tree. Pass between the rock and the tree, and traverse another 100 feet north. 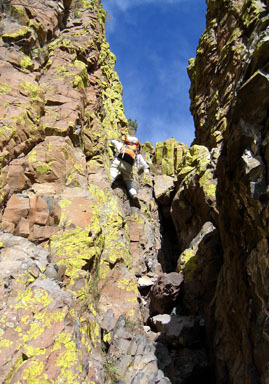 For the finale, climb west up a steep, Class 3 wall to reach the gentle summit slope. Stroll 100 yards west to the highpoint. 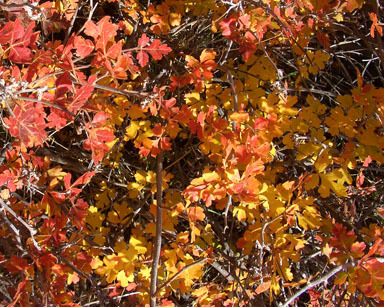 If you walk another 50 yards southwest from the highpoint, you can look down on the trailhead.